Can Antibiotic Treatment Possibly Just Make Things Worse For The Body? Home Cancer Can Antibiotic Treatment Possibly Just Make Things Worse For The Body? Immunity… it’s something immeasurably sacred that probably all of us, to some degree, take for granted because we’re blessed with it from birth. And yet, it’s the very essence of what keeps us alive. It serves us 24/7 protection against pathogenic bacteria and viruses that seek to destroy. Though not widely known, the immune system also operates, in large part, as the body’s “second brain.” Roughly 70% of this “brain” resides in the approximately 30 feet of digestive plumbing that stretches from the entry point (mouth) right on down to the exit. This second brain functions as the cradle of human life as it’s responsible for a number of critical tasks. These include processing and assimilating nutrients from food, filtering out and expelling waste, and communicating directly with our “first” brain (the one in our heads), on a routine basis. Much of this second brain is comprised of plentiful, but delicate, bacteria − more familiarly known as probiotics. These bacteria not only serve as a functional microbial army working to protect against harmful invaders, but also as a collective legion of living healers that maintains homeostasis. Put simply, a healthy, well-functioning immune system is designed to work symbiotically with the central nervous system to regulate a number of important bodily processes. When it’s thrown out of whack due to things like poor diet or toxic overload, serious health problems can arise. This same damaging state of gut dysbiosis can also spring up following use of antibiotics, which are commonly prescribed for everything from ear infections and colds to strep throat and pneumonia. Antibiotic Treatment Makes the Problem Worse! When they first hit the medical scene, antibiotics were actually hailed as some kind of all-encompassing cure for infectious disease. But thanks to advancements in modern science, we now know that antibiotics are enemy number one when it comes to maintaining a healthy immune system. That’s because antibiotics completely decimate the body’s internal microbial terrain. They indiscriminately target both “good” and “bad” bacteria throughout the intestinal tract and leave in their wake death, destruction, and utter desolation − the exact opposite of what our bodies need to live. Truth be told, the beneficial microbiota that naturally populate the human gut are fully capable on their own of keeping pathogenic bacteria at bay − without antibiotics − so long as they’re properly maintained and adequately nourished. 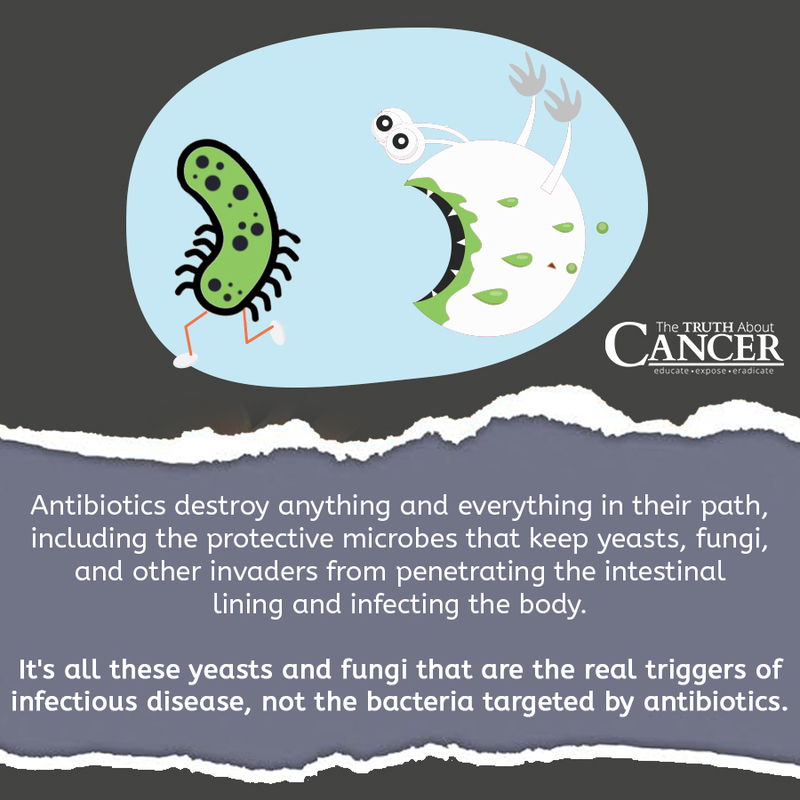 Antibiotics technically work in opposition to this normalization process because they destroy anything and everything in their path, including the protective microbes that keep yeasts, fungi, and other invaders from penetrating the intestinal lining and infecting the body. It’s all these yeasts and fungi that are the real triggers of infectious disease, it turns out, not the bacteria targeted by antibiotics. When antibiotics are introduced into the equation, these yeasts and fungi actually gain an upper hand because they no longer have to face the immune barriers that otherwise would have destroyed them at the gate. In their book The Fungus Link, Volume 2, authors Dr. Dave Holland, MD, and Doug Kaufmann refer to yeasts as “opportunistic organisms” that thrive in the absence of intestinal bacteria. Using their hyphae, yeasts are able to punch holes in the walls of an unprotected, antibiotic-damaged gut system, allowing toxins to enter the body indiscriminately. This is one of the pathways through which potentially life-threatening digestive conditions like leaky gut syndrome and Crohn’s disease are able to form. Another one of the more pressing public health concerns of our day is mycotoxicosis, also known as mold poisoning. Millions of people today suffer from its devastating effects, though many have no clue as to why. Science is continuing to uncover how the various metabolic byproducts of pathogenic fungi (known collectively as mycotoxins), are directly responsible for its growing prevalence throughout the developed world. Did you know that antibiotics are technically mycotoxins disguised as medicine?The non-synthetic varieties, at least, are derived straight from fungal metabolites, and they operate in much the same way, triggering the same types of systematic damage. Serious health conditions like urinary tract infections (UTI), for instance, that are often blamed on bacteria are actually a consequence of antibiotic use in many cases. Hence why their symptoms often worsen after a run of antibiotics. Mycotoxins are primarily an issue in commercial food that was grown in diseased and/or “dead” soils. More often than not, this results from these soils and the crops grown in them having been heavily sprayed with chemical pesticides and herbicides. Similarly to how the human immune system becomes compromised due to antibiotic exposure, chemical-sprayed soils are left stripped of their protective bacteria which leads to their eventual infestation with damaging fungi. The end result is the spawning of toxic fungal metabolites that eventually make their way into the general food supply, wreaking all kinds of health havoc on those who consume it. Nearly the exact same situation occurs inside your gut when you take antibiotics, by the way. If you think of antibiotics as being the mycotoxins that they truly are, you’ll be a lot less prone to take them at the whim of your doctor, who may not fully understand the consequences of their use. Another important little tidbit about bacteria in general is that they’re highly adaptable. When faced with a particular challenge − in this case, antibiotics − they quickly learn how to overcome it and become stronger and more resistant. When they accomplish this feat, they earn the title of “superbug,” which means the attacks levied against them are no longer effective. Superbugs are becoming a major problem in the world today, and much of what’s driven their growth and proliferation over the past several decades is the obscene overuse and abuse of antibiotics, both in conventional medicine and commercial animal farming practices. Besides the fact that many doctors still irresponsibly hand out antibiotic prescriptions like candy, many industrial farmers continue to pump their livestock full of the stuff to make them look fatter and more appealing. But appearance isn’t everything. These antibiotic-laden animals are typically very sick and full of toxins that easily passed through their drug-damaged intestines. And when they’re finally slaughtered, their tainted meat ends up spreading disease to the public, while at the same time contributing to wide-scale antibiotic resistance… not exactly a sustainable food production model. Avoiding antibiotics at all costs and greatly reducing their accepted uses in medicine and food production are among the only logical approaches to stemming this tide of widespread immune destruction, both in animal and human populations. Those with already-damaged guts also need a solid boost of probiotics and complementary prebiotics to help correct this damage. After all, our very existence as humans depends upon having a healthy gut. Next articleImmunology: What Makes A Successful Cancer Immunotherapy?